Ancient Roman silversmiths developed their craft to the highest levels of refinement and beauty. Applying fire and basic tools to the shaping of precious metals, many of their sophisticated techniques are still used today. This video illustrates the making of a stunning silver cup that has survived from the 1st century. NARRATOR: This ancient Roman cup is an extraordinary example of silversmithing. One of a pair, it was created in the first century A.D. and dedicated to Mercury at a sanctuary in northern France. It is one of the most exquisite pieces of Roman silver to survive. 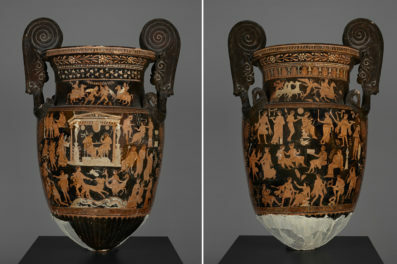 Ancient craftsmen employed a variety of sophisticated techniques to produce the multiple components of the cup, with its smooth inner liner, ornate outer shell, and cast handles and foot. Many of these techniques are still used by silversmiths today. The smooth inner liner was formed from a flat disk of silver. The silversmith began by hammering the center of the disk to create a rounded bottom. Then, rotating the disk over an anvil or wooden form, he hammered outward from the center to raise the sides. Repeated hammering hardened the silver, making it brittle and difficult to work. To make it more pliable, the silver was heated and then submerged in water to cool. This process, called annealing, was repeated periodically as the silversmith raised the liner. Once the liner reached its full height, it was turned on a wheel to smooth the surface and refine the shape. The rim was rolled outward to facilitate later assembly. X-rays of this cup reveal that an inscription was punched into the bottom of the liner, recording its weight. Never intended to be seen outside the workshop, this inscription indicates careful control of the valuable silver. The ornate outer shell was also raised from a disk of silver, but was made slightly larger and with a flatter bottom than the inner liner. 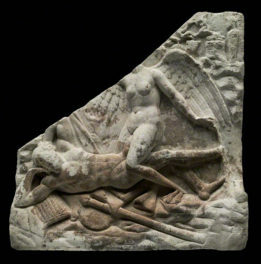 The complex scenes on the outer shell probably began as a drawing and a full-scale model in wax, clay, or plaster. Certain elements of the decoration in especially high relief were fashioned separately and attached as appliqués. which allowed multiple components to be made from a single prototype. From the prototype, a reusable master mold was produced for each part. Repeatedly filling the master mold with molten wax, the craftsman made multiple identical casting models. These were encased in clay and then fired, which melted out the wax [fire roars] and left a hollow casting mold into which silver could be poured. 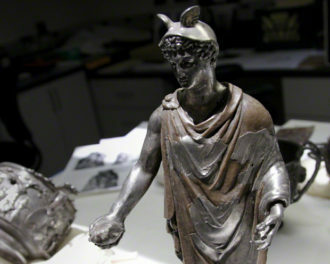 After the silver cooled, the mold was broken open, and the cast components were removed, separated, cleaned, and detailed. Once all the components were ready, the cup was assembled. The craftsman inserted the inner liner into the outer shell, interlocking their rims to form a smooth lip. Then the handles and foot were soldered to the body. This X-ray shows how the liner is suspended inside the outer shell, and how all of the components fit together. Finally, a mixture of powdered gold and liquid mercury—called amalgam—was selectively applied to the silver decoration. Heated, the mercury evaporated, [fire roars] leaving a thin coat of gold over the silver, accentuating elements of the design. The gilt cup was then burnished to a brilliant shine. Now almost 2,000 years old, the cup remains a testament to the expert craftsmanship of ancient artisans.